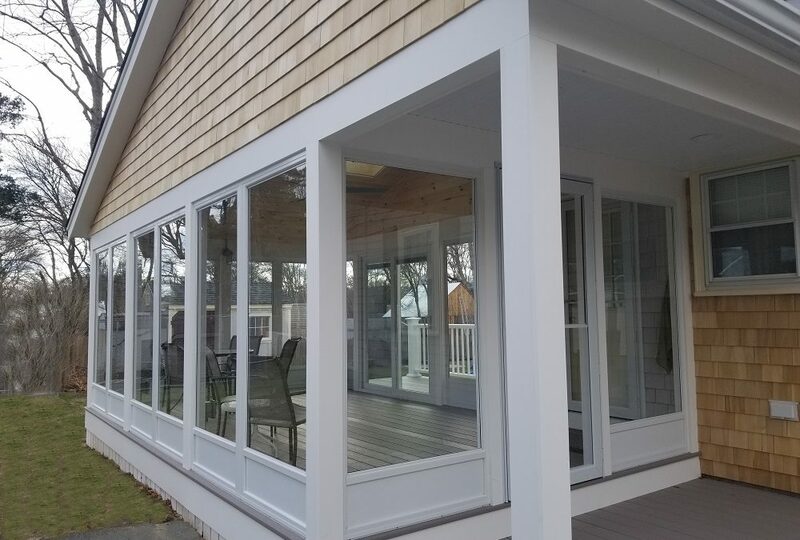 A three season sunroom and AZEK porch added light and living space to this Fairhaven, MA home! Custom framed and built to be a natural extension of its existing Cape Cod style, this home’s new three season sunroom invites an abundance of natural light into the room while protecting guests from the elements and pesky insects. Guests are welcomed with a simple front porch built with AZEK Harvest Collection decking in the color, Slate Gray; it is also used as the floor inside the sunroom. AZEK, the ultimate in capped polymer decking, provides both beauty and unbeatable durability. AZEK has been engineered to resist rot, insects, scratches, and mildew which means our homeowners will never have to sand, stain, or paint. In addition to a gorgeous collection of colors, AZEK decking is offered in several different textures that mimic the look of real wood. Be sure to check out our online portfolio to see other AZEK projects! 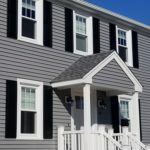 White cedar shingles, a traditional New England siding, were installed along with Kleer PVC trim. Dirt and rot resistant, Kleer PVC trim boards provide homeowners with clean, smooth edges for a beautiful finish. Harvey full view, glass/screen combination storm panels provide a panoramic view of the landscape while a Harvey patio door gives the homeowners easy access to backyard entertainment and relaxation. 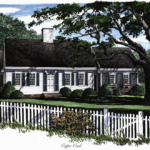 CertainTeed Landmark roofing shingles in the color, Granite Gray, were used to match the existing roof of main house. Sunrooms are a fantastic way to bring the outdoors inside your home. 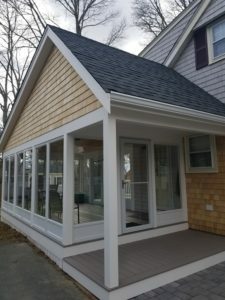 In addition to building conventionally framed sunrooms, like this project, we are the exclusive dealer of Betterliving Sunrooms for Cape Cod and South Boston. Betterliving sunrooms are custom, high quality vinyl and aluminum rooms that can be built right on your existing, code-compliant deck, porch, or patio. Explore our sunroom portfolio to see which type of room suits your personal style. Don’t postpone your project – we have financing options are available for qualified homeowners! Get a FREE quote on a new sunroom today! 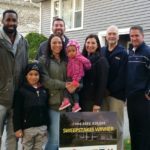 Give us a call at (508) 997-1111 or complete our our online form and we’ll follow up with you. Make your house a Care Free home!